How can identify a bad hosting team? August 12, 2010 September 5, 2014 BharathNetLeave a Comment on How can identify a bad hosting team? To find a good web hosting company is actually a matter of experience. Experience is the Teacher. But I am sure this teacher comes late. 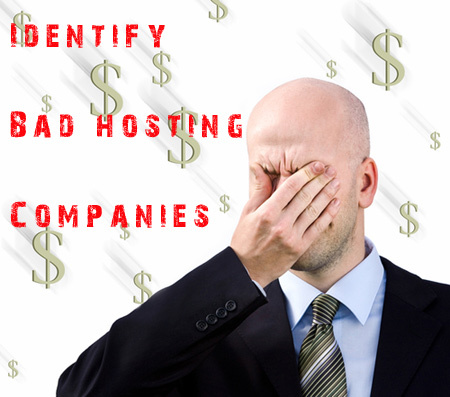 Identifying bad hosting companies help us to find good service provider in another way. Here I am going to list out some characteristics of bad server provider. Website has lot of offers! Pages are loaded with explanation of their great services. But when clicking on their contact page, you get only a contact form. No address! No Phone number! Sure, such website never be a platform for good hosting providers. Beware! Run away from them. Just send an email to their official sales/support team asking new offers. If their reply doesn’t reach your mail box within at least 2hr, pls dont stick with them. They are not able to handle clients in proper way. Sometimes they lack sufficient staff to serve you. Thanks for the open environment of internet! You can search with their company name in internet for reviews and commends on their hosting services. But dont trust on all views. Some competitive companies may reviewed such server providers negatively only with the intention of taring them and mislead the reader to their website. However you will get an overall idea while watching all the reviews. Unlimited space at just Rs.500! Unlimited domain registration at just Rs.2500! Free search engine listing for life! These are the some offers I noticed in some hosting websites. We must remember the fact that 1Kg rice costs Rs.20 -30. If someone come to us and offer 1000Kg at just Rs.50, do you believe him. This is common sense. Use your common sense while you search for a good hosting company. Professional web hosting firms never try to attract clients by lying. Above mentioned tips are not covering all aspects of identifying a bad service provider. But these points are basic methods to find out the nature of company before getting signed up with them. Wanted sales executive. Job opportunities in kochi, kerala. Start your web hosting business from Internet cafe.